As a lawyer, you may have a good understanding of where to find historical legal documents, cases, or precedents, but what about advisers, or mentors, or counsellors? Starting a legal career can be an isolating experience, with many new lawyers spending time working alone while drafting documents or doing research. That’s why it usually takes a deliberate effort to find effective mentors. Mentorship builds better lawyers, and it also builds happier lawyers. Professionals benefitting from mentorship often find they have higher satisfaction with their careers and are more likely to feel capable performing their daily tasks. A strong network of knowledgeable and helpful confidants may be the most important investment you will make in your career, and this article will give you a sense of how to start building that network from day one. When building mentor-type relationships, it’s important to keep in mind that it’s relationships, plural. In their paper, “Is More Truly Merrier? : Mentoring and the Practice of Law,” Fiona Kay and Jean Wallace conclude that “individuals benefit more from having multiple mentors over the course of their career.” It is the ability of professionals to draw on a “constellation” of mentors and a broad and diverse range of individuals for mentoring support that best portends success. Having multiple mentors leads lawyers to higher job satisfaction, better perceived career success, better earnings, and a sense of real social value to their legal work. It also provides a new lawyer with a variety of perspectives, drawn from a broad range of experiences. More importantly, having multiple mentor-figures allows many types of individuals to play different roles in a lawyer’s career. For example, as a lawyer, you will sometimes be looking for the assistance of teachers. Learning about an unfamiliar area of the law, or staying up-to-date on new developments, is the purview of continuing professional development, higher education, or self-directed learning. At other times, you may be in need of sponsors: people that are able to act as personal references and provide networking contacts. 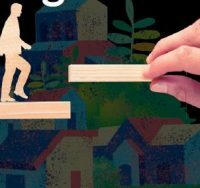 Perhaps most importantly, lawyers may, at different points in their career, need to look beyond their professional mentors and advisors if they require the assistance of counsellors or mental-health professionals. These relationships are important, normal, and can be accessed through the Member Assistance Program available to all Ontario lawyers and law students. Two other important forms of mentoring relationships are those of advisor and coach. An advisor is someone that can help with a particular problem and has particular practice area expertise. This relationship will often be characterized by questions and answers, may be with someone you seek help from only once. A coach, on the other hand, is someone that can help you improve a particular skill, such as client communications, time management, or business development. Coaching relationships are built on a specific goal you wish to work toward. Sole practitioners or those practising in small firms often have the most difficulty finding mentors. And while lawyers practising in larger firms will often have access to mentoring-type figures in both formal and informal contexts, they can often benefit from seeking assistance outside the firm. Addressing this need is the mandate of the LSO’s Coach and Advisor Network (CAN). Launched in November 2016, CAN is offered to all Ontario lawyers and connects those looking for coaches or advisors with experienced counsel that can offer assistance. As of June 2018, the program coordinated more than 200 volunteer senior lawyers from around the province who each have, on average, more than 20 years of experience. CAN focuses exclusively on coordinating coaching and advising relationships. Advisors within CAN respond to one-off inquiries, completed in a single, confidential telephone call, and are usually matched to a lawyer seeking assistance within three days. A coaching relationship, on the other hand, consists of five one-on-one meetings between parties and is usually completed within three months. In addition to professional legal experience, coaches are trained by CAN on coaching techniques using texts, videos, and workshops. Kerry Boniface, the director of CAN, stresses that finding the right fit is important, saying, “we’re happy to do a rematch, and you can use the service as often as you want. You can have both an advisor and a coach at the same time, or multiple advisors.” Matches are made based on the particular goals of the lawyer requesting assistance, and on their request can also take into account gender, ethnicity, and shared communities of interest. Antonio Urdaneta is another lawyer with experience as both a mentee and a mentor with CAN. When he first moved his practice to Canada from his native Venezuela, he benefited from senior lawyers sharing their knowledge and providing important contacts, which led to volunteering opportunities, which led to career opportunities. Now, as an established workplace lawyer himself, he gives back, in part, by acting as a coach and advisor to other lawyers. Knowing who you can and should consult to address particular problems or goals is one of the most important things you will do in your career. While CAN provides invaluable coaching and advising services, it’s important to remember that it is just one piece of a successful support system for a legal career. Some particular issues and questions, such as ethical conundrums, can be best assisted by a call to the LSO’s Practice Management Helpline. Wellness and mental health problems, which affect many lawyers and non-lawyers, can best be addressed through assistance from the counsellors and wellness professionals available through the Member Assistance Program. And a phone call to LAWPRO, of course, will provide lawyers with assistance pertaining to potential or actual malpractice claims. As you build your support network, don’t be afraid to ask for help from those who are best able to provide it. Whether it be career or life advice, skill coaching, specific file advice, or professional counselling services, a larger team will allow you to receive the best assistance possible, while not expecting any individual mentor figure to provide help outside of their own expertise and knowledge. 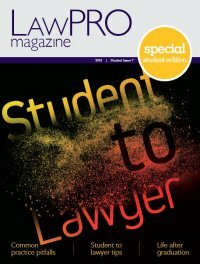 Shawn Erker is Legal Writer & Content Manager at LAWPRO.